Is photoplethysmography more than just a two dollar word? If you peel back the layers of the Apple Watch, tossing its premium look and features like the Force Touch screen and the Digital Crown to the side, you'll eventually be left with one piece of tech that's par for the course in most of today's smartwatches: a heart rate sensor. 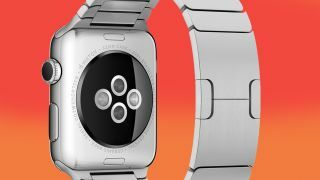 Not to be outdone by the Microsoft Band, Basis Peak and other competition in the wearables category, Apple Watch can track your heart rate with the sensor located on the flipside of its watch face. But the main attraction isn't how Apple Watch interprets the heartbeat data, but (read this in your best Jony Ive voice) how Apple is trying to power a wrist-sized evolution in the way we communicate through technology. Before we get too ahead of ourselves, let's do an overview of how the Apple Watch's heart rate sensor works. How does the Apple Watch's heart rate sensor work? Fitness isn't the sole focus of the Apple Watch, but don't count it out. Its sensor, which rests in the circular back of the watch, is a tag-team effort comprised of infrared light blasters and green LEDs. They work together to employ a tried and true (but difficult to pronounce) technique called photoplethysmography to give users an accurate heart rate reading. "Blood is red because it reflects red light and absorbs green light. Apple Watch uses green LED lights paired with light‑sensitive photodiodes to detect the amount of blood flowing through your wrist at any given moment. When your heart beats, the blood flow in your wrist - and the green light absorption - is greater. Between beats, it's less. By flashing its LED lights hundreds of times per second, Apple Watch can calculate the number of times the heart beats each minute - your heart rate." Wouldn't flashing the green LEDs "hundreds of times per second" plague the Apple Watch battery life to die in a jiffy? Yes, it would. But the green LEDs kick on only when they're needed. For the rest of the work, the infrared light comes into play. This low-power tracking mode sends your heart rate to the Health app every 10 minutes, which compiles the data into a graph for you to study, if you choose. But if this method of heart rate monitoring isn't producing consistent, reliable data, the green LEDs will kick back into gear as a failsafe. Apple Watch packs guts capable enough to track several types of workouts, but like most trackers, it has limitations. Will the Apple Watch heart rate sensor work on my wrist? Apple is upfront about the likelihood that, for some users, the heart rate sensor just might not work very well – or at all – even under favorable conditions. In the same support document, Apple stresses that wearing the smartwatch correctly on your wrist is key, but you probably guessed that much. The heart rate sensor can't detect much of anything if the Apple Watch isn't "snug and comfortable." Still not getting a good reading? As it turns out, there are also a host of other factors that could be to blame for a lousy reading. Some are environment-related: for example, if it's cold outside, the Apple Watch will have a hard time giving you a reading when circulation to your wrist is reduced. That said, if circulation to your extremities is an ongoing issue for you even in a warm room, an external Bluetooth heart rate monitor will give you better, more consistent results. Lastly, Apple points out that the Watch might be choosy when it comes to tracking during your preferred activities. "Rhythmic movements, such as running or cycling, give better results compared to irregular movements, like tennis or boxing." Sorry, jousters and parkour athletes.